Shaky plans for a US $50 billion oil port and industrial complex on Burma’s southeast coast at Dawei (Tavoy) are looking even more uncertain after Thailand disclosed that it is re-appraising its strategic trade transport infrastructure to look at domestic ports. The change in focus was outlined by a senior government planner at an Association of Southeast Asian Nations (Asean) conference in Bangkok. The meeting was to map out transport links as the 10-nation bloc moves closer to creating a single market. The news comes after Burma’s government blocked proposals by Bangkok construction giant Italian-Thai Development to build a huge 4,000-megawatt coal power plant to fuel the Dawei project. Thailand now plans to develop Laem Chabang, its port near Bangkok at the top of the Gulf of Thailand, as a regional hub for “upper Asean”—comprising Thailand, Cambodia, Laos, Vietnam and Burma. 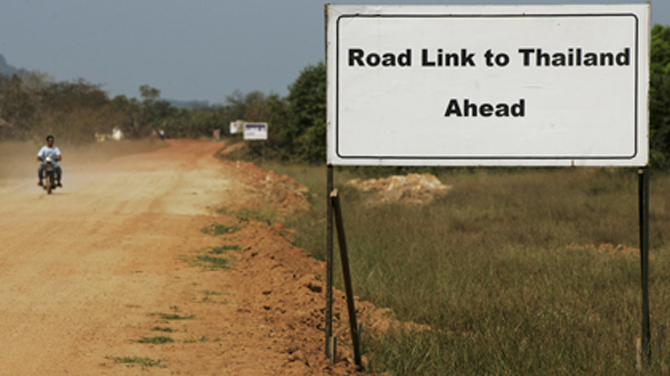 Thailand is also examining the possibility of an oil “land bridge” south of Dawei. It is a role that was being earmarked for Dawei where Italian-Thai Development is supposed to be spearheading a large oil shipment port at the heart of a new special economic zone approved by the Burmese government. “This represents a huge shift in [Thai] government thinking, effectively closing down the idea of Thailand's Western gateway being Dawei,” said the UK-based industry magazine Port Strategy this week. “A port at Pakbara on the Andaman coast is now being considered, a move which puts the land bridge notion back on the long term agenda,” the magazine commented. Thailand’s government recently called for a feasibility study on developing a crude oil pipeline land bridge across the narrowest section of Thailand linking the Indian Ocean in the west with the Gulf of Thailand and the South China Sea in the east. Pakbara is in southern Thailand near the Malaysian island of Langkawi. From there is it only 100 km across Thailand to the gulf coast at Mueang Songkhla. The Dawei project has been in limbo since the 4,000-megawatt coal plant was blocked and the Naypyidaw government cast doubt on using gas as an alternative fuel. Without a means to generate large volumes of electricity, the port development—including oil storage and shipment, a petrochemicals complex and other industrialization—would be difficult to implement. Italian-Thai Development said in February that it would need three months to look at alternatives for powering Dawei, designated as Burma’s first special economic zone under the new government. Thailand’s Energy Policy and Planning Office is now examining the oil land bridge proposal and is due to make recommendations in six months. Both this idea and the Dawei port project are aimed at improving trade and oil transportation links between East and South Asia, and farther afield to the oil fields of the Middle East by avoiding the long and congested journey via the Malacca Straits at the southern tip of peninsular Malaysia and Singapore. at the best location with fair deep sea. This is good news for Myanmar. The Dawei deep sea port SEZ was designed to benefit Thailand and other SEAP Nations, more than for Myanmar anyhow. Why not build an international grade airport there and develop it as a residential and tourism destination, while also preserving the local lifestyle, culture and the environment as much as possible? This will certainly be good news if it holds...anything can change...on the whole it will be good news if its true...at least for the people and the environment as a whole. And more importantly the NEW CRONIES of the Junta is given "a shot in the back" Max Construction of Max Myanmar Group. Anyway, as our sources puts it Max does not have the funds to even start with the project so is ITD, ITD was hoping that the current Thai government is asking a loan from either IMF or World Bank and ITD hopes it can request a loan to start the Dawei project, Max Myanmar it seems from our sources is in "RED" financially and is frantically looking for investors...they we understand have put-off any investments themselves, well perhaps Max may not be Max in the near future or in the next short few years...chapter may close...make way for REAL good businessman. Definitely they don't want to ruin Phuket beaches. But they would not care so in Burma. Dan Becker, director of the Sierra Club's Global Warming and Energy Program, said that the term clean coal is misleading: "There is no such thing as 'clean coal' and there never will be. It's an oxymoron." Natural gas burns more cleanly than other hydrocarbon fuels, such as oil and coal, and produces less carbon dioxide per unit of energy released. Burning natural gas produces about less carbon dioxide than burning coal?. This natural gas produces few amount of Nitrogen Oxides and very few amount of Sulfur Dioxide. And no Mercury. That natural gas is deposited in our 2000 miles long coast in huge amount and alongside of our Irrawaddy river.